His master told him to wait by the cathedral steps. And so he did, for 225 years, since they day they were separated by a crowd inside that stone building. He even slept nearby, waiting, in case there was one molecule of smell from the man he loved. Once, they lived in a palace and life was an adventure. His master had been a chemist who could cure anything. His potions were known throughout the land, but few noticed that he never aged. Indeed, because of a powder his master created, they’d seen many centuries together, good times and bad, love, pain and death. He thought about those times as he waited on the cathedral steps, until the day he caught a scent that made him think his master was near. It was a man named Vilder, a colleague of his master’s who’d caused much anguish. He was never sure if Vilder was benign or cruel, threatening or cajoling. Though he’d been told to wait, he had to follow this enemy. Vilder could be the last link to his master. The first thing you’ll notice, as you start “Tomorrow” is how the dog-narrator’s voice sounds inside your head. It’s got strength and intelligence, it’s keenly emotional, and it’s there immediately. Dibben takes readers on a tour spanning more than two centuries in a dazzling story that’s rich with details. The language is perfect, the scenarios lend a whiff of magic, there’s chance to shed a tear or two, and the history is dead-on. It’s fantasy without being fantastical. And yet, that’s still not the main appeal of this book. 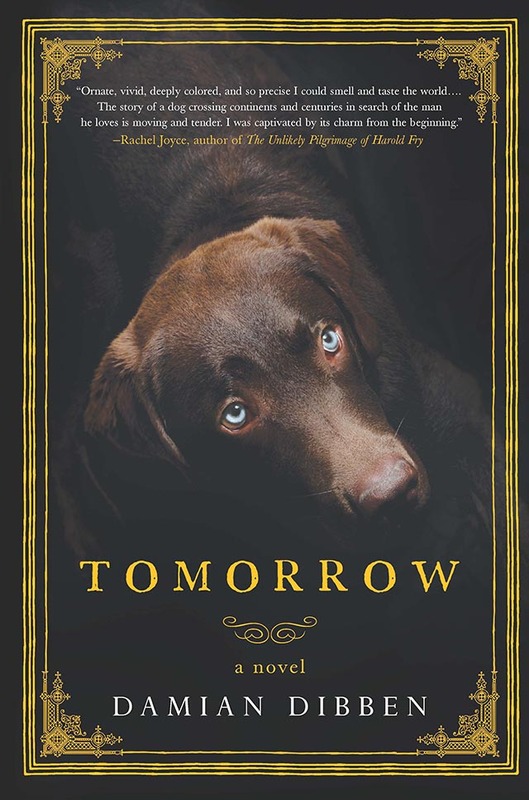 What hooks readers is the narrator himself, a dog whose name we don’t learn until the end. You’ll think of your own pooch as you read this story of faithfulness and friendship, loss, hope and despair. You’ll understand its urgency, and you’ll turn pages like mad. Alas, because of its dark fairy-tale tone, this book won’t appeal to everyone. Even so, if you loved Umberto Eco, James Owen, or tales of palace intrigue, war, and danger, you’ll love “Tomorrow” without a shadow of a doubt. The Bookworm is Terri Schlichenmeyer. Terri has been reading since she was 3 years old and she never goes anywhere without a book. She lives on a hill in Wisconsin with two pampered pooches and 13,000 books.